Co-CEOs Andrew Nagle (left) and Paul Conrad are brothers-in-law and part of the fifth generation of a family that has run A-B Emblem and its predecessor companies, which date back to 1892. Every time an American astronaut ventures outside the confines of the Earth’s atmosphere, a little piece of Western North Carolina goes along for the ride. 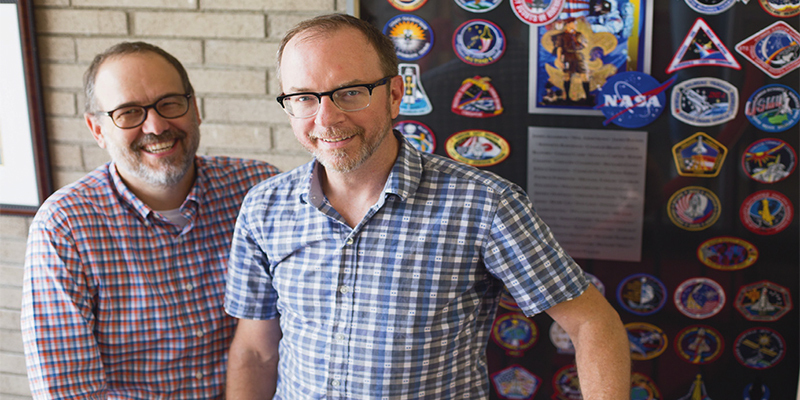 That’s because all of NASA’s uniform patches are manufactured by Buncombe County-based A-B Emblem, which has spent decades supplying not only space travelers but an untold number of law enforcement officers, military personnel, Boy and Girl Scouts, and many others. In a region that has lost most of its manufacturing, A-B Emblem is a spectacular exception. 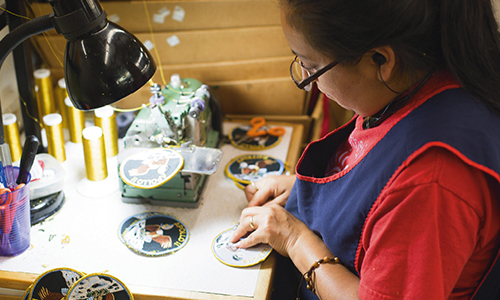 Between its Weaverville headquarters and two satellite factories in Mexico and China, the company has deftly navigated the changing tides of globalization, remaining the world’s leading supplier of embroidered patches and insignia since the 1960s. 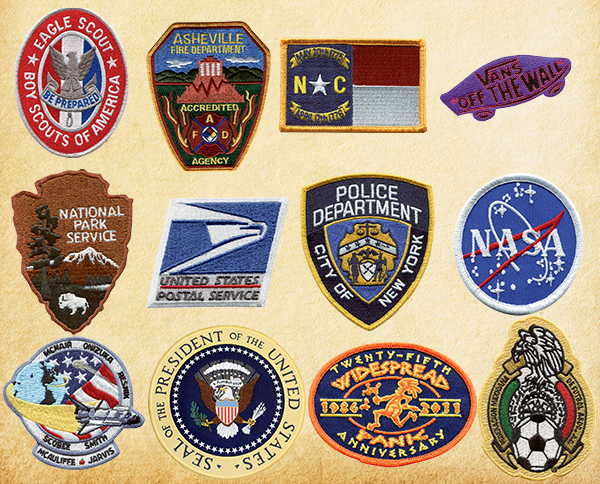 From the US armed forces to countless other government agencies, companies, and civic groups, A-B Emblem is the go-to source for uniquely designed patches. For such a vast operation, it’s ironic how simple and rooted its underpinnings are, according to Paul Conrad, co-CEO. “Our whole livelihood depends on a lockstitch—the needle goes in, the shuttle goes up, the needle goes out—just a single stitch,” he says. It’s an observation his great-great grandfather, Albin Wunderlich, could have made in 1892, when he started making fine lace embroidery in a small town in Germany. Conrad’s grandfather brought the business to the United States in the 1940s and to Weaverville in 1963. 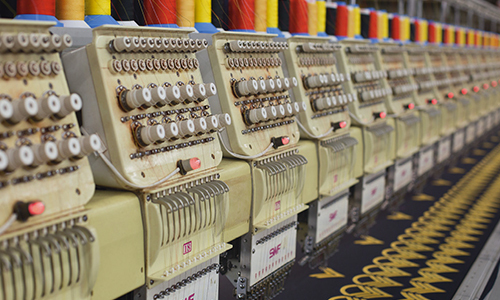 A-B Emblem’s reach is hard to quantify, but the company provides some telling numbers: Each year, it produces some 70 million patches, using about two million miles of thread. About 125,000 of its works have journeyed into space since the company got the NASA contract in 1971. While much of the manufacturing at A-B Emblem is done on machines, some finishing flourishes require the human touch. “The fun thing is, we get to see our products everywhere,” says Andrew Nagle, the other co-CEO. Because of a US law requiring that materials for the armed forces be manufactured in-country, the company’s work at the Weaverville facility shows up on virtually every service members’ uniform. Domestic production also includes a steady stream of rush orders that can’t wait on shipping from abroad. But that’s just the start of it: A-B Emblem’s patches and other embroidered works appear on White House jackets and presidential airplanes, several major corporations’ products, Little League World Series uniforms, various national parks’ promotional products, the signature green jackets at the Masters golf tournament, and hundreds of other places. Some are as simple as NASA’s classic logo, dubbed “the meatball,” while others are intricate works of art. Custom-designed small-batch orders—of which the company does more than a thousand a month—are a key part of the company’s success, with recent clients including the likes of Shania Twain, Snoop Dogg, and Bruno Mars, along with hundreds of civic groups, motorcycle clubs, and just about any style of organization that seeks a patch. The same machines that produce patches signifying military rank also crank out ones for bands and sports organizations. “We’ve weathered the storm,” Nagle says of the company’s continued success. “For a long time, nobody else was doing what we’re doing from this country, and over the years, people kind of left behind the idea that ‘Made in the USA’ is important, but we’re seeing a resurgence of that.” What’s more, he says, nostalgia for a time when ways of signaling identity and membership were valued runs strong.